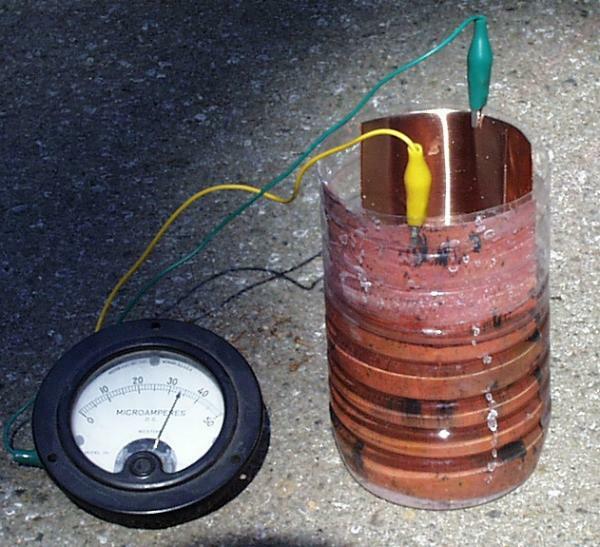 Building your own solar battery. 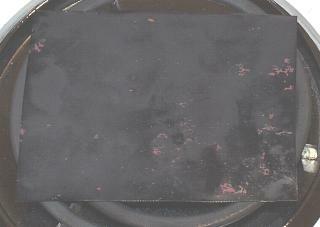 A flat panel solar battery. Building a Hydrogen Fuel Cell. Make a spectroscope from a CD. Stacking photos for high depth of field. A solar cell is a device for converting energy from the sun into electricity. The high-efficiency solar cells you can buy at Radio Shack and other stores are made from highly processed silicon, and require huge factories, high temperatures, vacuum equipment, and lots of money. If we are willing to sacrifice efficiency for the ability to make our own solar cells in the kitchen out of materials from the neighborhood hardware store, we can demonstrate a working solar cell in about an hour. Our solar cell is made from cuprous oxide instead of silicon. Cuprous oxide is one of the first materials known to display the photoelectric effect, in which light causes electricity to flow in a material. Thinking about how to explain the photoelectric effect is what led Albert Einstein to the Nobel prize for physics, and to the theory of relativity. 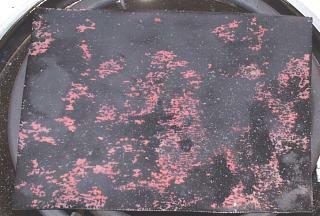 A sheet of copper flashing from the hardware store. This normally costs about $5.00 per square foot. We will need about half a square foot. A sensitive micro-ammeter that can read currents between 10 and 50 microamperes. Radio Shack sells small LCD multimeters that will do, but I used a small surplus meter with a needle. 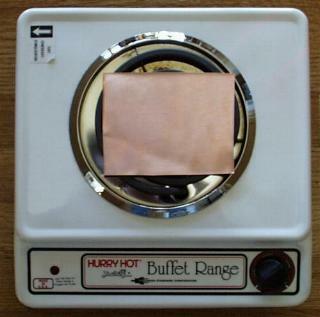 An electric stove. My kitchen stove is gas, so I bought a small one-burner electric hotplate for about $25. 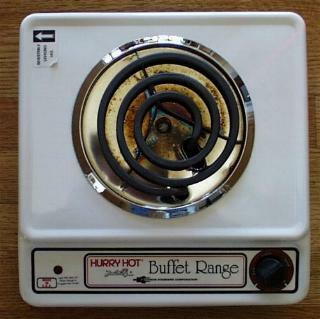 The little 700 watt burners probably won't work -- mine is 1100 watts, so the burner gets red hot. A large clear plastic bottle off of which you can cut the top. I used a 2 liter spring water bottle. A large mouth glass jar will also work. Table salt. We will want a couple tablespoons of salt. Sand paper or a wire brush on an electric drill. Sheet metal shears for cutting the copper sheet. 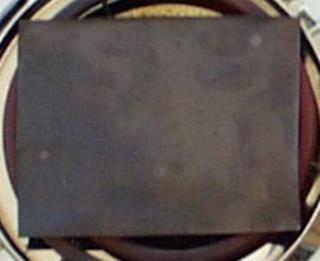 The first step is to cut a piece of the copper sheeting that is about the size of the burner on the stove. Wash your hands so they don't have any grease or oil on them. Then wash the copper sheet with soap or cleanser to get any oil or grease off of it. Use the sandpaper or wire brush to thoroughly clean the copper sheeting, so that any sulphide or other light corrosion is removed. 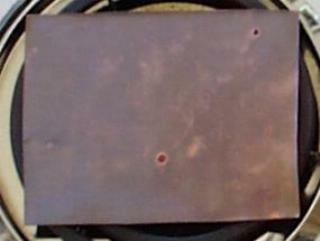 Next, place the cleaned and dried copper sheet on the burner and turn the burner to its highest setting. 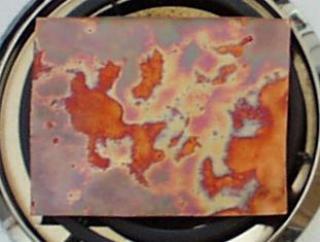 As the copper starts to heat up, you will see beautiful oxidation patterns begin to form. Oranges, purples, and reds will cover the copper. 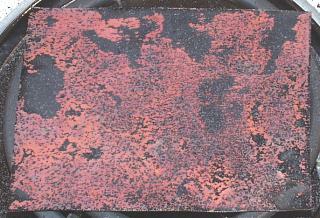 As the copper gets hotter, the colors are replaced with a black coating of cupric oxide. This is not the oxide we want, but it will flake off later, showing the reds, oranges, pinks, and purples of the cuprous oxide layer underneath. The last bits of color disappear as the burner starts to glow red. 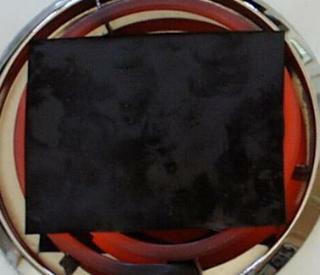 When the burner is glowing red-hot, the sheet of copper will be coated with a black cupric oxide coat. Let it cook for a half an hour, so the black coating will be thick. This is important, since a thick coating will flake off nicely, while a thin coat will stay stuck to the copper. After the half hour of cooking, turn off the burner. Leave the hot copper on the burner to cool slowly. If you cool it too quickly, the black oxide will stay stuck to the copper. As the copper cools, it shrinks. The black cupric oxide also shrinks. But they shrink at different rates, which makes the black cupric oxide flake off. The little black flakes pop off the copper with enough force to make them fly a few inches. This means a little more cleaning effort around the stove, but it is fun to watch. When the copper has cooled to room temperature (this takes about 20 minutes), most of the black oxide will be gone. A light scrubbing with your hands under running water will remove most of the small bits. Resist the temptation to remove all of the black spots by hard scrubbing or by flexing the soft copper. This might damage the delicate red cuprous oxide layer we need to make to solar cell work. The rest of the assembly is very simple and quick. Cut another sheet of copper about the same size as the first one. Bend both pieces gently, so they will fit into the plastic bottle or jar without touching one another. The cuprous oxide coating that was facing up on the burner is usually the best side to face outwards in the jar, because it has the smoothest, cleanest surface. Attach the two alligator clip leads, one to the new copper plate, and one to the cuprous oxide coated plate. Connect the lead from the clean copper plate to the positive terminal of the meter. Connect the lead from the cuprous oxide plate to the negative terminal of the meter. Now mix a couple tablespoons of salt into some hot tap water. Stir the saltwater until all the salt is dissolved. Then carefully pour the saltwater into the jar, being careful not to get the clip leads wet. The saltwater should not completely cover the plates -- you should leave about an inch of plate above the water, so you can move the solar cell around without getting the clip leads wet. The photo above shows the solar cell in my shadow as I took the picture. Notice that the meter is reading about 6 microamps of current. The solar cell is a battery, even in the dark, and will usually show a few microamps of current. The above photo shows the solar cell in the sunshine. Notice that the meter has jumped up to about 33 microamps of current. Sometimes it will go over 50 microamps, swinging the needle all the way over to the right. Cuprous oxide is a type of material called a semiconductor. A semiconductor is in between a conductor, where electricity can flow freely, and an insulator, where electrons are bound tightly to their atoms and do not flow freely. In a semiconductor, there is a gap, called a bandgap between the electrons that are bound tightly to the atom, and the electrons that are farther from the atom, which can move freely and conduct electricity. Electrons cannot stay inside the bandgap. An electron cannot gain just a little bit of energy and move away from the atom's nucleus into the bandgap. An electron must gain enough energy to move farther away from the nucleus, outside of the bandgap. Similarly, an electron outside the bandgap cannot lose a little bit of energy and fall just a little bit closer to the nucleus. It must lose enough energy to fall past the bandgap into the area where electrons are allowed. When sunlight hits the electrons in the cuprous oxide, some of the electrons gain enough energy from the sunlight to jump past the bandgap and become free to conduct electricity. The free electrons move into the saltwater, then into the clean copper plate, into the wire, through the meter, and back to the cuprous oxide plate. As the electrons move through the meter, they perform the work needed to move the needle. When a shadow falls on the solar cell, fewer electrons move through the meter, and the needle dips back down. The cell produces 50 microamps at 0.25 volts. This is 0.0000125 watts (12.5 microwatts). Don't expect to light light bulbs or charge batteries with this device. It can be used as a light detector or light meter, but it would take acres of them to power your house. The 0.0000125 watts (12.5 microwatts) is for a 0.01 square meter cell, or 1.25 milliwatts per square meter. To light a 100 watt light bulb, it would take 80,000 square meters of cuprous oxide for the sunlit side, and 80,000 square meters of copper for the dark electrode. To run a 1,000 watt stove, you would need 800,000 square meters of cuprous oxide, and another 800,000 square meters of plain copper, or 1,600,000 square meters all together. If this were to form the roof of a home, each home would be 282 meters long and 282 meters wide, assuming all they needed electricity for was one stove. There are 17,222,256.7 square feet in 1,600,000 square meters. If copper sheeting costs $5 per square foot, the copper alone would cost $86,110,283.50 USD. Making it one tenth the thickness can bring this down to $8,611,028.35. Since you are buying in bulk, you might get it for half that, or about $4,300,000.00. If you used silicon solar panels costing $4 per watt, you could run the same stove for $4,000.00. But the panels would only be about 10 square meters. Or, for about a dollar, you can build a solar stove out of aluminum foil and cardboard. For about $20, you can build a very nice polished aluminum parabolic solar cooker. Next: a flat panel solar cell . Ingredients: What's in the Stuff We Buy? 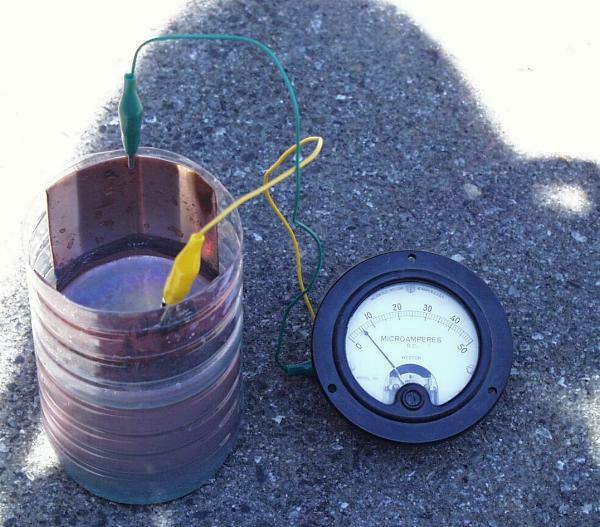 Chapter 4: Radio -- Build a simple crystal radio set. Fast, simple, cheap, and it uses no power. © sci-toys.com. All rights reserved.